Someone has been huffing and puffing and blowing down the home of Slim the Pig. Who could it be? Detective Dillon is on the case, and you’ll need to watch the puppet show to see if Dillon catches the culprit! 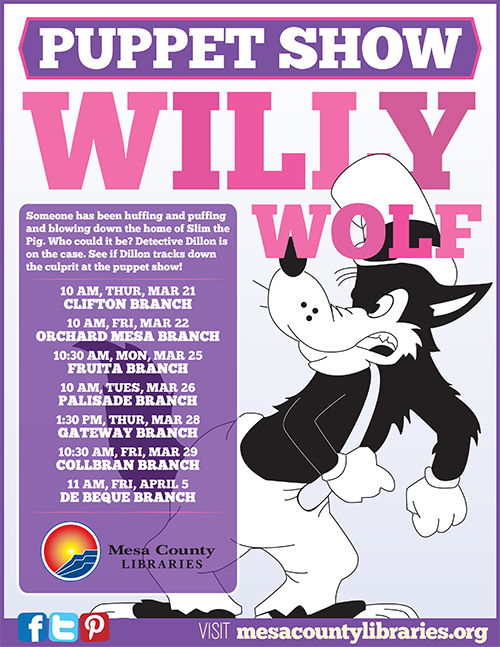 10 a.m. Friday, March 22, at the Orchard Mesa Branch, 230 Lynwood Ave.
10:30 a.m. Monday, March 25, at the Fruita Branch, 324 N. Coulson Ave.
10 a.m. Tuesday, March 26, at the Palisade Branch, 119 W. Third St.
10:30 a.m. Friday, March 29, at the Collbran Branch, 111 Main St.
11 a.m. Friday, April 5, at the De Beque Branch, 730 Minter Ave.
Posted in Branches, General, Kids, Library News, Programs/Classes.